I'm Seeing Green: Burn That Grass! Coal power plants create a lot of pollution, with the US EPA saying "coal-fired power plants spew 59% of total U.S. sulfur dioxide pollution and 18% of total nitrogen oxides every year." 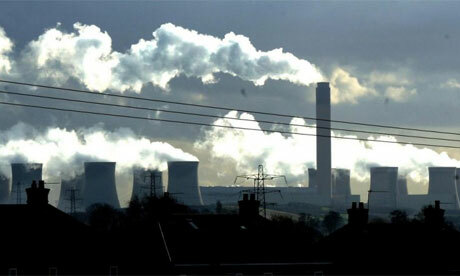 In Britain, still heavily dependent on old coal plants, the EU mandate to clean up the plants may result in several shut downs, according to this story from the Daily News, resulting in brown- or black-outs. The UK's largest power station, Drax, launched a £50m project today aimed at replacing 10% of the coal it uses with biomass. Mixing materials such as wood chips, sunflower husks or grasses with coal to generate electricity could reduce the power station's annual carbon dioxide emissions from coal by several million tonnes. Executives from Yorkshire-based Drax signed a deal with Alstom to build a processing plant that could prepare 1.5m tonnes per year of biomass for use in the power station. Under the plans, biomass would be ground into a fine powder and injected directly into the power station's coal-fired furnaces. Building work for the processing plant will start later in 2008 and the first part of the facility is expected to be completed by the end of 2009. Neil Crumpton, energy campaigner at Friends of the Earth, said that using biomass in power stations or combined heat and power schemes is a better use of the resource than, for example, turning it into liquid biofuels for use by diesel-engine vehicles. "Co-firing with biomass is a reasonable way forward - it's a logical extension of what Drax is already doing and I've got no qualms with it on that score. If it helps build the sustainable biomass market in the UK, then all well and good." Without doubt the most important parameter to factor into your calculations.